foster cooperative relationships between scientists and fishermen. 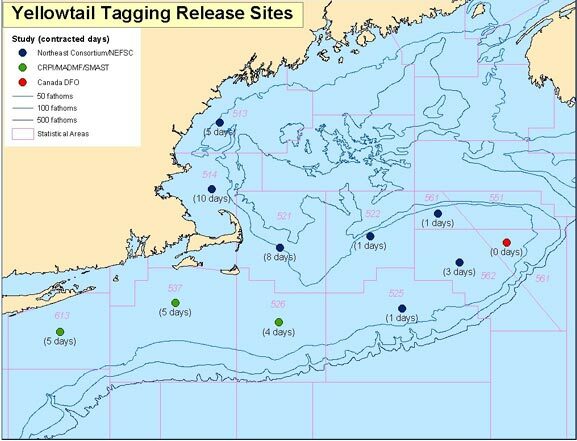 Tagging areas are assigned based on the NMFS statistical areas, and tagging effort put forth in each area is in proportion to geographic	patterns	of abundance. SMAST has been assigned the areas in southern New England. These areas include 613 (south of Long Island), 539 (south of Rhode Island), 537 (south of Massachusetts), and 526 (southeast of Massachusetts and southwest of	Georges	Bank	including	most	of	the	Nantucket Lightship Closed Area).